You are here: Home / Grange Notes / Grange Sign from the ground up! Grange Sign from the ground up! The photo at the top of this email shows the concrete going into the forms for the new Grange sign. Kurt Giavara (right) supervised setting the “big-foot” type forms the week before; I arranged to get some stainless steel bars to anchor in the concrete along with more commercial post-bases. 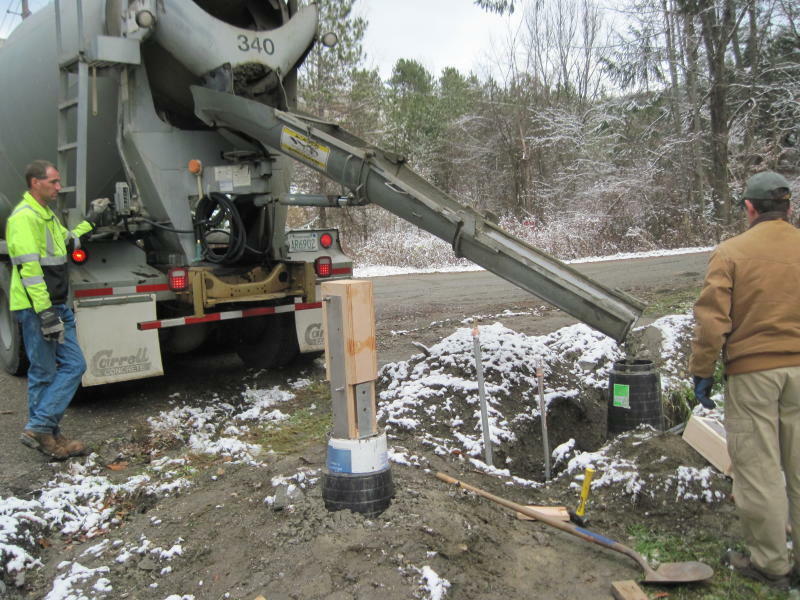 On Friday the 14th, we had the forms filled with concrete, and placed the stainless bars and dummy “posts” in the concrete, at the correct spacing to match the posts and cherry cross-piece donated by TimberHomes LLC. Dave Cain is preparing the lettering on the cherry piece so that we can erect the parts soon. Looking for carpentry volunteers to help us put up the posts, and to build and install the small roof for the sign. If there is someone who could bring an 8′ or 10′ stepladder, that would be an extra help! Please contact me if you can help us! As usual I can be reached at 225-8921, or the email address for these Grange Notes. After the whole sign is up, we’ll have electrician Alana Norway pull wires through the conduits placed during the summer by another crew of volunteers. She’ll also install the fluorescent lights which will illuminate the sign. We’ve decided to put the lights on a timer so they will be on from about dusk to midnight, so our sign will be visible. Our intent is to increase our recognition, so people will know where our Hall is, and that it is available for rental. The sign will give the website, and the phone number for rentals–see below for a transition in our rental agent. As regular readers will know, we badly need to get more tenants to balance our budget. And providing a Hall for public use is the major community service which our Grange provides.